Recently, I read a blog post by Andrea Chilcote about being stranded in Atlanta during the monster snowstorm that struck the region. I live in Nebraska, so I'm accustomed to dealing with the fluffy - or slick - snowflakes and ice. I've been stranded by snowdrifts or spun into the ditch by a patch of dark ice enough times that I do not envy being put in that position. Chilcote's theme, though, hit a chord, not just literally, but figuratively. Daily, I carry my MacBook, reporter's notebook, calendar, billfold, an assortment of pens, pencils and highlighters, my digital camera, phone and some junk I obviously could make it through the day without to my desk in the newsroom. Most of these items are tools of the trade, necessary elements that help make my job easier. 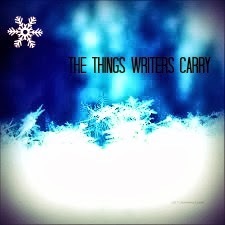 Daily, I carry bits and pieces that linger in my mind, waiting for a story to come to fruition or a poem to take shape. Small scraps of interviews, a word or phrase that won't let go, an image framed by the viewfinder that haunts me: these are the things that I, as a writer, carry. These are elements that leave an editorial remark in my mind, that cannot be shared in a straight, fact-based news story, because these are my views of a particular moment. As writers, we take our unique view and spin stories to entertain, inform, persuade. We carry those stories deep inside until it is ready to be unleashed from brain and transferred to paper. It's a natural process, as natural as a single snowflake fluttering to the ground. I happen to prefer the blizzard. LuAnn--The bit about the physical things we carry...Worthwhile. The part about the stories we carry inside us...Valuable.